Bircher muesli is one of the best ways to start the day – naturally sweet and oh so nourishing, it really does give you the sustenance to skip out the door. Bircher muesli was created circa 1900 by a Swiss German physician Maximilian Bircher-Benner to nurse his patients back to health the old fashioned way – with a hearty injection of nutrients derived from raw food. 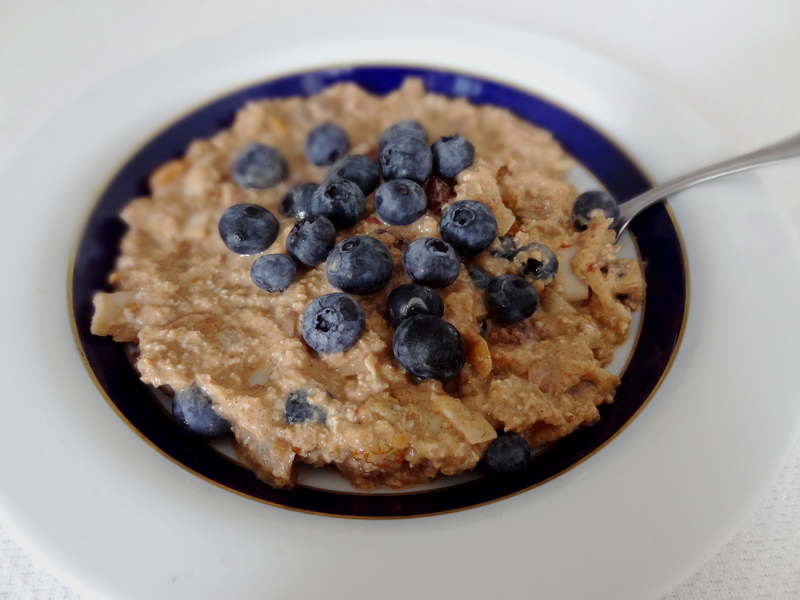 It is essentially a combination of oats, fruit and nuts, soaked in juice overnight. There are many variations of the original and the way that I enjoy mine is super creamy, full of spice and packed with plumped-up super fruit. Bircher muesli is also very practical – it’s simple to prepare at night whilst cooking your dinner and is easily transported if you are taking a container full to work or, much preferably, the park to eat. Oats are a nutritional wunderkind, providing serious nutrition to many, many people all around the world, mostly on week days. Oats contain high levels of both soluble and insoluble fibre, which is good news for digestion as it keeps the digestive track cleansed and in tip-top shape and also keeps you full for longer. Bircher muesli is also heart smart, with the oats and sunflower seeds providing cholesterol-lowering goodness from manganese, selenium and magnesium. The high protein content in oats, sunflower seeds and amaranth coupled with the antioxidant hit from the super fruit make this a power breakfast fit for both Olympic athletes and generally awesome athletes, like ourselves. To serve: 2 tablespoons of puffed amaranth and extra fruit (blueberries work especially well). Mix the ingredients together in a bowl and leave to soak overnight. Stir in puffed amaranth to serve and garnish with extra fruit. Dig in. * I usually add about 1 teaspoon of cinnamon but I prefer mine extra spicy.